Often by the time the customer has applied their changes to a standard design we get something quite different. This customer knew that his fiancee to be liked one of my halo designs on the website. This ring below would be the design we would start with. Grain set on the left and channel on the right. Based on those guidelines we looked at options for the setting style of the halo and something that might suit the above changes better. 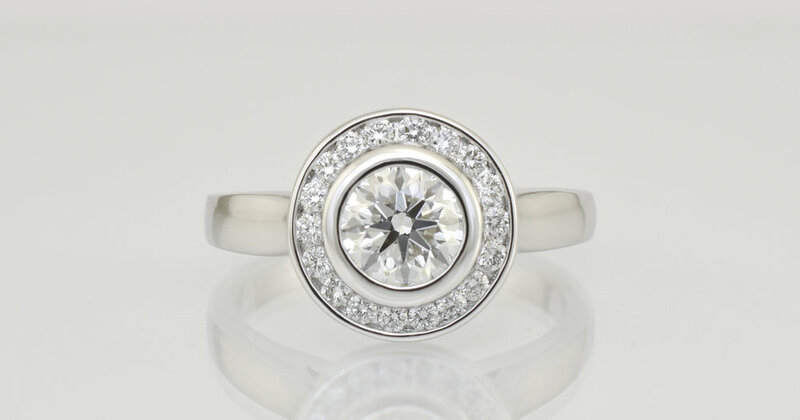 In the original design the diamonds in the halo were claw set. I put the option of channel setting to the customer which in the end was selected. The original design featured a .50 carat in the centre. My customer`s budget allowed for us to increase that diamond to a .60 carat size in the same quality. Knowing roughly the desired finger size I did a mockup of the design so far. The customer liked the design but I wanted to put a few more options to him. At the time I was designing this ring I had just added a new pear shaped diamond design to my engagement rings on the website. I proposed to the customer to use the gallery and band from that ring with his halo. The band and gallery we would apply to his ring. The final changes we made to the design pleased the customer greatly. It is really nice to have the option to modify design aspects rather than just make everything to standard designs. The ring was made in 18ct Palladium white gold. The centre diamond was .62 carats in weight, F colour and Si1 clarity. The GIA certified diamond had "Excellent" grades for cut, polish and symmetry. Total diamond weight for the ring was .78 carats.